With the ProForm Performance 400i, you can stock your home with a reliable entry-level treadmill that is adorned with a handful of top notch and very useful features to give your exercise life extra spice. With an updated 2.5 HP motor that is more powerful than older models, 18 built in workout programs, Bluetooth, music and iFit connectivity, as well as meticulously designed ergonomics, the 400i by ProForm is a really good machine to own if you’re mindful of your budget and want a reliable machine to serve your workout needs for a price-tag that doesn’t burn a whole in your pocket. In this review, we will break down the treadmill’s features to determine just how well and worthy the ProForm Performance 400i is to earn a place in your home gym. The ProForm Performance 400i Treadmill comes at dimensions of 72.8” x 36” x 61” respectively and has a space-saver design which means it won’t take up unnecessary space in your home. The treadmill can be folded when not in use and can also comfortably be tucked somewhere. Transport wheels at the base of the treadmill make it possible to wheel the machine from one place to another, making it easier to move around if you’d like to transport the treadmill from one room to another. An 55” inch running area makes it moderately good for average height people to do walking and jogging exercises, but taller people might occasionally struggle because the area of the conveyor belt may be narrow for their strides. The ProForm Performance 400i Treadmill features an awesome console. At the heart of it is the Watts LED display which is an upgrade over the basic LCD of the older models. Based on the measuring algorithm of Watts per Kilogram, the LED screen shows your power output which can allow you to keep track of your levels of exertion all in one glance. With the help of the display you’ll be able to tell directly if you’re working in the Endurance, Peak, or Tempo zone. The Endurance is a great mode for a slow and steady workout that over a span of time becomes a test of endurance. The Tempo zone places you in your ideal heart rate based on your weight category, and Peak is where you reach the maximum settings for your cardio exercises. The console also features an integrated tab holder where you can place your tab and multi-task while you exercise. The tab holder is safe, secure, and keeps your tab conveniently close to you while you use it for whatever purposes you deem fit (especially when connected to iFit). The Performance 400i itself has speed levels that can go up to a maximum of 10MPH, and automated incline settings that can be adjusted anywhere between 0%-10%. QuickSpeed and QuickIncline buttons make it possible to adjust levels of speed and the incline angle through a simple push of a button. The console itself is loaded with 18 preset workout programs all of which consist of different speed and incline settings that will add diversity to your workout training. They can be increased or decreased in intensity to best suit your requirements at the time and are specifically programmed to help burn fat or increase your overall cardiovascular fitness. One top notch feature that comes with the ProForm Performance 400i is the iFit compatibility. A subscription for iFit can be bought separately and that added feature will blow wide open the number of exercises you can possibly do with the 400i. The iFit coach will guide you through a very large arsenal of GlobeTrek workouts. By connecting your treadmill to iFit via Bluetooth, you’ll be able to do countless new exercises through Google Maps too. The iFit Coach also allows you to save your workout data and check its progress over a span of time. Heart rate sensors that are built into the handlebars help keep track of your heart rate which in turn feeds the reading to the console as it adjusts the treadmill’s speed and incline to suit your pulse rate the best. Keeping track of your heart rate during exercise can help you maximize your time. Music compatibility allows you to connect your smartphone and/or iPod to enjoy the experience of music through two high quality Intermix Acoustic 2.0 speakers. 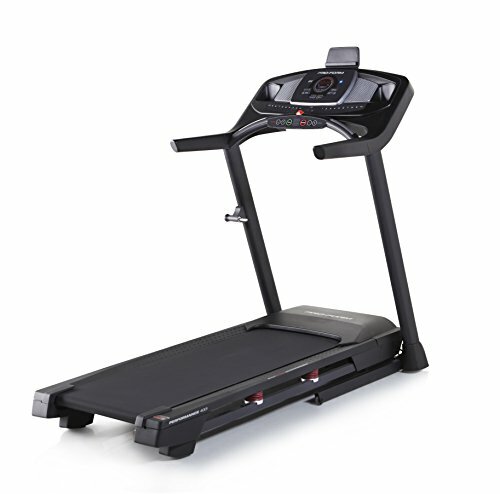 The ProForm Performance 400i treadmill is a solid steel construction and is heavy duty built to accommodate users of maximum weight capacity of 300 lbs, although it has been reported that after months of use some of the machine’s components may begin to rust. A 2.5 HP Mach Z motor is an upgrade over the 2.25 HP of the previous models. It has to be stated that the motor is most suitable for walking and jogging exercises as the standard for running now requires a 3.0 HP motor. Still the 2.5 HP Mach Z motor paired with the incline and speed settings are pretty good enough to ensure workouts will remain fresh and challenging. The patented Proshox cushioning on the running area reduces impact on joints and ankles by 28% and helps you recover quickly post-workout. 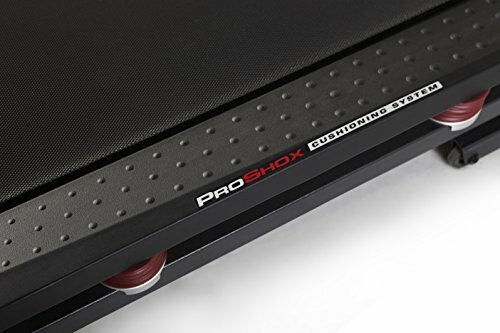 The ProForm Performance treadmill may have a few set of flaws but there’s no denying that for its price, the machine offers a very impressive array of high quality features that is built to stand the test of time. 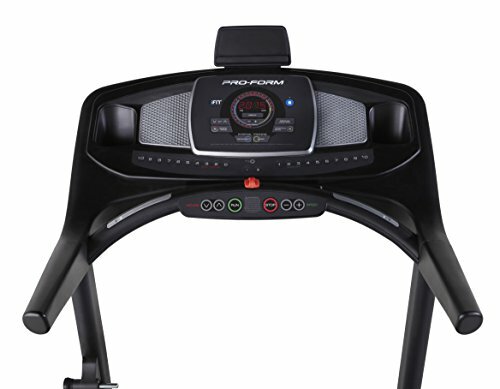 The ProForm Performance 400i is designed to last and has the best deck cushioning as well as console among most commercial grade treadmills. You simply cannot go wrong with this treadmill unless you don’t receive a component or two!